What is Asbestosis? Symptoms and Treatment. Can I make an asbestos claim? Can I Make a Claim for Asbestosis? If you have been diagnosed with an asbestos disease, such as Asbestosis, in the last 3 years you may be able to make a claim for compensation. The success of the asbestos claim will depend on whether the company where the exposure occurred is still in existence. If you are not sure, don't worry; it could be that the company was taken over, or that the insurers of the company where you worked still exist. In either case we will find out on your behalf as part of the service. For advice on whether you can make an asbestos claim, simply call us on freephone 0800 923 0046. Asbestosis is a form of pneumoconiosis - a scarring condition of the lung - caused by breathing in asbestos fibres. Asbestos fibres are long, extremely thin, microscopic glass-like fibres that are not filtered by the nose or the lungs. Once inhaled the asbestos fibres travel deep into the lungs to one of gas exchanging structures called an alveolus. Each alveolus has many cleaning cells called macrophages that eat up any fibres that made it down to the alveoli. The macrophages cannot eat the asbestos fibres because they are too long, so they are cut open and digestive molecules spill into the alveolus, these molecules injure the alveolus and cause it to form a scar. This scarring formation is called fibrosis and causes the lungs to shrink and stiffen. People who are exposed to asbestos over a long period inhale hundreds and thousands of asbestos fibres, which causes this large-scale injury. Major lung damage (fibrosis) develops and it is called Asbestosis after the disease-causing particle. Asbestosis is a form of interstitial lung disease and should not be confused with Pleural Thickening or Pleural Plaques which arise in the lung pleura - i.e. the membrane covering the lung. Asbestosis is a chronically progressive disease . Scarring of the lung tissue makes it hard to breathe and so there is less oxygen reaching the lungs. Initial symptoms can include shortness of breath, fatigue and loss of appetite, chest tightness and pain, crackles within the lungs and a less common sign of swollen rounded fingers and toes, known as clubbing. In severe cases, Asbestosis can be fatal. People working in industries such as plumbing, demolition work and at power stations, were likely to have been exposed to breathing in fibres of asbestos often over a period of years. Asbestosis can take 20 years or more to develop, so ill effects are not instantly traceable to asbestos. A diagnosis of Asbestosis is usually achieved using a variety of tests including a through physical examination, chest X-ray, CT chest scan. biopsy of the lung tissue and lung function tests. How many people suffer from this condition? The number of deaths from this asbestos induced condition continues to rise in the UK - this is a legacy from heavy exposure to asbestos in workers in the 50s, 60s and 70s when there was high usage e.g. as an insulating material and to protect against fire. The number of cases has risen dramatically from 1978 when there were only 132 cases to 980 cases in 2012. The latest statistics from the HSE : Asbestosis in Great Britain 2013 shows that the new cases applying for Industrial Injuries Disablement Benefit has increased more quickly than the number of deaths attributed to asbestosis. In 2010 1,015 people were assessed for IJDB for asbestosis. Taking numbers from the Asbestosis register, there were 178 deaths in 2011 where asbestosis was specifically recorded as the underlying cause of death and 429 deaths where asbestosis is likely to have contributed as a cause compared with 109 in 1978. Is there any Treatment for Asbestosis? Asbestosis normally occurs after heavy exposure to asbestos over many years. As with the other asbestos related conditions there is no method of repairing the damage to the lung from this hazardous material. Unfortunately Asbestosis is an irreversible condition and there is no cure for it. Some people find that their condition remains stable whereas others find it progresses and the symptoms becomes worse. People who have Asbestosis are at greater risk for lung cancer, especially if they smoke. It is therefore essential for a smoker with Asbestosis to stop smoking immediately to try and lessen the chance of this and to maintain optimum lung function in healthy lung tissue. Some treatments are available which help with the symptoms of the condition and may improve the quality of life of the sufferer e.g. oxygen therapy. Flu vaccines will help lower risk of lung infections. If symptoms are very severe, a lung transplant may be considered. Asbestos - Are you still at risk? 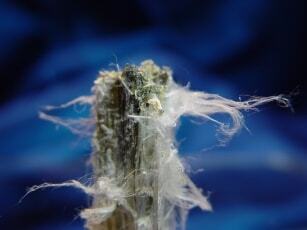 Asbestos is a naturally occurring fibre which is mined in various parts of the world, notably South Africa and Canada. It occurs in three forms known as blue, brown and white asbestos. It can be processed in several ways for industrial use. Its' properties of resistance to heat, electricity and sound, make it useful for a variety of purposes, particularly insulation and brake linings. Asbestos can still be found in a wide variety of buildings, including homes, schools and hospitals, often in lagging around pipes and boilers as well as in ceilings and walls. It can be a hazard to health and for this reason its use has declined considerably in recent years. There are now strict regulations to prevent dangerous levels of exposure. Discovery of asbestos in a building often causes alarm among people living and working in it. However, as long as the asbestos is well maintained and preferably covered by an impermeable layer of paint or other material so that it is not releasing dust, it does not present any hazard to health. It is only the inhalation of loose asbestos fibres which may cause diseases. 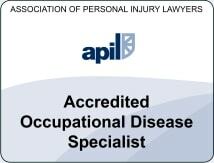 If you have been diagnosed with asbestosis in the last 3 years and want advice on making an asbestos claim then please contact us. We are available 7 days a week.